Check out the Spring book preview from Scholastic including my new novel Storm Runners. Scholastic Preview. This cover compels me to read it. My students will be waiting with excitement for this to be published and on their desks! Do you need any students to give feedback on the book? I bought Storm Runners at the book fair. I hope that I don’t have to wait too long to find out how it ends! Will The Surge be out yet this year? I sure hope so! What a great book! It’s called The Surge and it will be out in September. please let it be ourt soon. My students are killing me over it! If i have an online code to read a couple chapters of Storm Runners: Surge what website do I go on? I loved the first book and I am thrilled to read the next one!! I think your teacher would have to do that through the Scholastic clubs. I have an online acess code to read the first chapters of the surge too. I know how to get to the site. But where do you type the code in? I don’t know how this work. I think you might have to ask your teacher or librarian. I’m going to contact my Scholastic rep and make sure that this is in my bookfair at the end of the month. Finished it in 1 day and can’t to tell my kiddos about it! My book club for boys only, The Page Turners Club here at North Central Middle School, will dive into your book tomorrow. Is there somewhere I can go to get activities, writing prompts and the like that go along with the book? There is curriculum for all of my novels on my webpage. Free of charge. Say hello to your club for me. 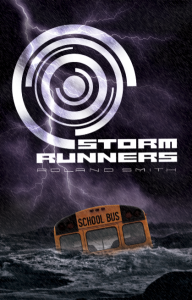 Roland I am booktalking”Storm Runners” and “Surge” in middle school classes in Jackson County, Or. You visited years ago. I really was kept riveted by the first book. Since Surge was released around the time of hurricane Irene, the whole story is so relevant to students living in non-hurricane areas, what happens in these big storms. Question: What hurricane if any did you base the first part the story on? Most of what I know about hurricanes are in the books. The fictional hurricane Emily is a compilation of hurricanes I’ve been involved with in the SE when I was a wolf biologist reintroducing red wolves. I have never been in one as bad as Emily…thankfully. I’ve finished the third book ERUPTION. It will be out in March. I am going to read the surge right now!I wonder how it will end. The book is great so far. This book was totally worth the buy!